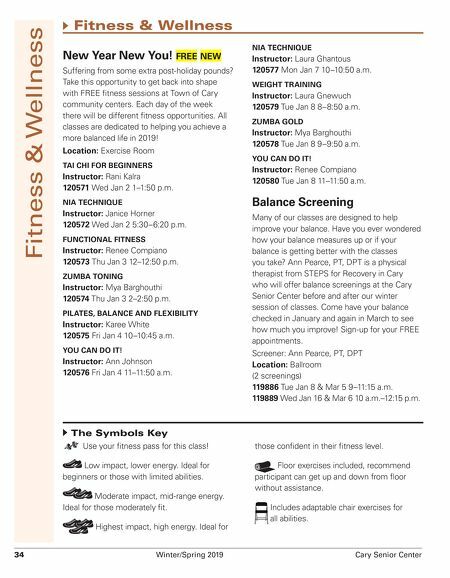 34 Winter/Spring 2019 Cary Senior Center Fitness & Wellness NIA TECHNIQUE Instructor: Laura Ghantous 120577 Mon Jan 7 10–10:50 a.m. WEIGHT TRAINING Instructor: Laura Gnewuch 120579 Tue Jan 8 8–8:50 a.m. ZUMBA GOLD Instructor: Mya Barghouthi 120578 Tue Jan 8 9–9:50 a.m. YOU CAN DO IT! Instructor: Renee Compiano 120580 Tue Jan 8 11–11:50 a.m. Balance Screening Many of our classes are designed to help improve your balance. Have you ever wondered how your balance measures up or if your balance is getting better with the classes you take? Ann Pearce, PT, DPT is a physical therapist from STEPS for Recovery in Cary who will offer balance screenings at the Cary Senior Center before and after our winter session of classes. Come have your balance checked in January and again in March to see how much you improve! Sign-up for your FREE appointments. 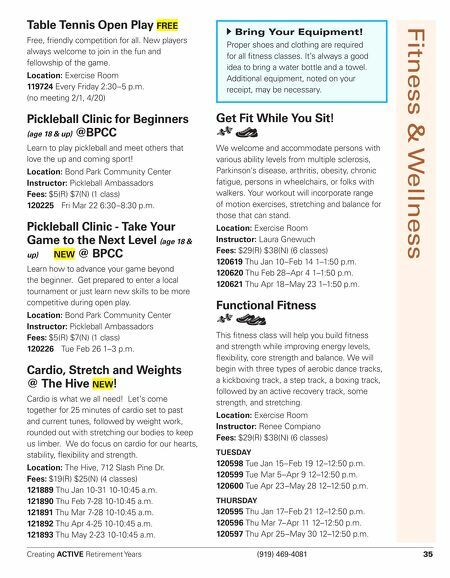 Screener: Ann Pearce, PT, DPT Location: Ballroom (2 screenings) 119886 Tue Jan 8 & Mar 5 9–11:15 a.m. 119889 Wed Jan 16 & Mar 6 10 a.m.–12:15 p.m. New Year New You! FREE NEW Suffering from some extra post-holiday pounds? Take this opportunity to get back into shape with FREE fitness sessions at Town of Cary community centers. Each day of the week there will be different fitness opportunities. All classes are dedicated to helping you achieve a more balanced life in 2019! Location: Exercise Room TAI CHI FOR BEGINNERS Instructor: Rani Kalra 120571 Wed Jan 2 1–1:50 p.m. NIA TECHNIQUE Instructor: Janice Horner 120572 Wed Jan 2 5:30–6:20 p.m. FUNCTIONAL FITNESS Instructor: Renee Compiano 120573 Thu Jan 3 12–12:50 p.m. ZUMBA TONING Instructor: Mya Barghouthi 120574 Thu Jan 3 2–2:50 p.m. PILATES, BALANCE AND FLEXIBILITY Instructor: Karee White 120575 Fri Jan 4 10–10:45 a.m. YOU CAN DO IT! Instructor: Ann Johnson 120576 Fri Jan 4 11–11:50 a.m. c Fitness & Wellness c The Symbols Key Use your fitness pass for this class! Low impact, lower energy. Ideal for beginners or those with limited abilities. Moderate impact, mid-range energy. Ideal for those moderately fit. Highest impact, high energy. Ideal for those confident in their fitness level. Floor exercises included, recommend participant can get up and down from floor without assistance. Includes adaptable chair exercises for all abilities.